It has been reported to me that it was the rhetorician Isocrates who was responsible for the servitude that the Macedonian imposed on the Persians. For the fame of the speech Panegyricus, which Isocrates delivered to the Greeks, spread to Macedonia, And it was this that first stirred Philip’s animosity towards Asia. When Philip died, the speech provided the incentive for his son Alexander, heir to his father’s estate, to keep up Philip’s momentum. When he went up to Ilium, Menoetius the pilot crowned him with golden crown; after him Chares the Athenian, coming from Sigeum, as well as certain others, both Greeks and natives, did the same. And indeed, there is no other single individual among Greeks or barbarians who achieved exploits so great or important either in regard to number or magnitude as he did. 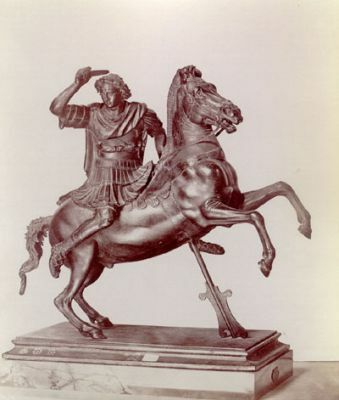 To make the Greeks partners in his victory, Alexander sent the Athenians a special gift of three hundred shields taken from the enemy, and, for the Greeks in general, had a very proud inscription carved on the other spoils: An offering from Alexander, son of Philip, and the Greeks, apart from the Spartans, taken from the barbarians who live in Asia. Alexander wanted lo reinvigorate his men, it now being wintertime, and remained there at Persepolis for four months. It is said that, when the king first seated himself on the royal throne under the golden awning, the Corinthian Demaratus – a kindly man who had been a friend of Alexander’s father – burst into tears, as old men do. Those Greeks had been deprived of a very pleasurable experience, he reportedly said, who had died before seeing Alexander seated on Darius’ throne. For, personally, I am not in agreement with the Corinthian Demaratus who claimed that the Greeks missed a very pleasurable experience in not seeing Alexander seated on Darius’ throne. Actually, I think they might have had more reason to shed tears at the realizalion that the men who left this honour to Alexander were those who sacrificed the armies of the Greeks at Leuctra, Coronea, and Corinth and in Arcadia. From king Alexander to the people of Chios, written in the Prytany of Deisitheos; All those exiled from Chios are to return, and the constitution on Chios is to be democratic. Drafters of legislation are to be selected to write and emend the laws so as to ensure that there be no impediment to a democratic constitution and the return of the exiles. Anything already emended or drafted is to be referred to Alexander. The people of Chios are to supply twenty triremes, with crews, at their own expense, and these are to sail as long as the rest of the Greek naval force accompanies us at sea. With respect lo those men who betrayed the city to the barbarians, all those who escaped are to be exiled from all the cities that share the peace, and to be liable to seizure under the decree of the Greeks. Those who have been caught are to be brought back and tried in the Council of the Greeks, In the event ol disagreement between those who have returned and those in the city, in that matter they are to be judged by us. Until a reconciliation is reached among the people of Chios, they are to have in their midst a garrison of appropriate strength installed by King Alexander The people of Chios are to maintain the garrison. He set the Persian palace on fire, even though parmenio urged him to save it, arguing that it was not right to destroy his own property, and that the Asians would not thus devote themselves to him, if he seemed determined not to rule Asia, but only to pass through as a conqueror.but Alexander replied that he intended to punish the persians for their invasion of Greece, the destruction of Athens, the burning of the temples, and all manner of terrible things done to the Greeks: because of these things, he was exacting revenge. But if you consider the effects of Alexander’s instruction, you will see that he educated the Hyrcanians to contract marriages, taught the Arachosians to till the soil, and persuaded rhe Sogdians to support their parents, not to kill them, and the Persians to respect their mothers, not to marry them. Most admirable philosophy which induced the Indians to worship Greek gods and the Scythians to bury their dead and not to eat them! We admire the power of Carncades, who caused Clitomachus formerly called Hasdrubal and a Carthaginian by birth, to adopt Greek ways . We admire the character of Zeno, who persuaded Diogenes the Babylonian to turn to philosophy. Yet when Alexander was taming Asia. Homer became widely read, and the children of the Persians, of the Susianians and the Cedrosians sang the tragedies of Euripides and Sophocles. And Socrates was condemned by the sycophants in Athens for introducing new deities, while thanks to Alexander Bactria and the Caucasus worshipped the gods of the Greeks. Plato drew up in writing one ideal constitution but amid not persuade anyone to adopt it because of its severity, while Alexander founded over 70 cities among barbarian tribes*” sprinkled Greek institutions all over Asia, and so overcame its wild and savage manner of living- Few of us read Plato’s Laws but the laws of Alexander have been and are still used by millions of men. Those who were subdued by Alexander are more fortunate than those who escaped him, for the latter had no one to rescue them from their wretched life, while rhe victorious Alexander compelled the former to enjoy a better existence. |. […] Alexanders victims would not have been civilised if they had not been defeated. Egypt would not have had its Alexandria, nor Mesopotamia its Selcucia, nor Sogdiana its Prophthasia, nor India its Bucephalia, nor the Caucasus (the Hindu Kush) a Greek city nearby; (329) their foundation extinguished barbarism, and custom changed the worse into better. If, therefore, philosophers take the greatest pride in taming and correcting the fierce and untutored elements of men’s character, and if Alexander has been shown to have changed the brutish customs of countless nations then it would be justifiable to regard him as a very great philosopher. Furthermore the much-admired Republic of Zeno, the founder of the Stoic school, is built around one guiding principle: we should not live in separate cities and demes each using its own rules of justice, but we should consider all men to be fellow demesmen and citizens, with one common life and order for all, like a Hock feeding together in a common pasture. This Zeno wrote, conjuring up as it were a dream or an image of a well-ordered and philosophic constitution, but it was Alexander who turned this idea into reality, for he did not follow the advice of Aristotle and treat the Greeks as a leader would but the barbarians as a master* nor did he show care for the Greeks as friends and kinsmen, while treating the others as animals or plants; this would have filled his realm with many wars and exiles and festering unrest. Rather believing that he had come as a god-sent governor and mediator of the whole world he overcame by arms those he could not bring over by persuasion and brought men together from all over the world mixing together, as it were in a loving-cup their lives customs, marriages and ways of living. He instructed all men to consider the inhabited world to be their native land, and his camp to be their acropolis and their defence, while they should regard as kinsmen all good men, and the wicked as strangers. The difference between Greeks and barbarians was not a matter of cloak or shield, or of a scimitar or Median dress. What distinguished Greekness was excellence, while wickedness was the mark of the barbarian; clothing, food, marriage and way of life rhey should all regard as common, being blended together by ties of blood and the bearing of children. When he came to Elaeus he offered sacrifice to Protesilaus upon the tomb of that hero, both for other reasons and because Protesilaus seemed to have been the first of the Greeks who took part with Agamemnon in the expedition to Ilium to disembark in Asia. The design of this sacrifice was that disembarking in Asia might be more fortunate to himself than that it had been to Protesilaus. But as many of them as he took prisoners he bound in fetters and sent them away to Macedonia to till the soil, because, though they were Greeks, they were fighting AGAINST GREECE on behalf of the foreigners in opposition to the decrees which the Greeks had made in their federal council. For Alexander did not think it safe, while the war against the Persian was still going on, to relax in the slightest degree the terror with which he inspired the Greeks, who did not deem it unbecoming for them to serve as soldiers on behalf of the foreigners against Greece.